Many educators are familiar with word cloud tools such as Wordle, Tagxedo, and Tagul, which allow students to create colorful visualizations of text that can be posted online or saved as an image. Word clouds quickly analyze text to create a shape in which the words that appear most frequently appear bigger and bolder. They’re a great way for students, especially visual learners, to distill and summarize information and quickly identify what’s important in a body of text. Word clouds can be used in all subjects and with all grade levels to promote critical thinking, improve vocabulary, analyze texts, assess student writing, prompt student reflection, illustrate an event, classify objects or parts of speech, and more. 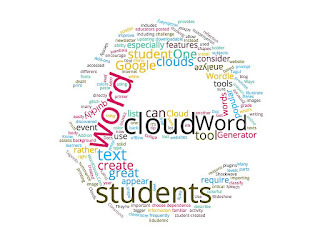 Edudemic provides a great list of 5 Ways to Use Word Clouds in The Classroom. One popular activity, especially early in the school year, is for students to create a “Get to Know Me” word cloud that includes a list of words that students use to describe themselves. Instead of printing student-created word clouds, consider importing the images to a Google Slideshow, student blog, or classroom website. If you must print, be sure to require that students use a plain white, rather than a solid color background, to save on printer ink. My other tip is to encourage students to copy and paste their text, rather than type directly into the word cloud tool so that, in the event of an Internet glitch, their efforts are not lost. One of the most popular word cloud websites, Wordle, was offline for a while. It’s back now, but in the interim I discovered another tool that has some great features. WordClouds.Com is a free tool that has a lot of cool features, including the ability to choose different shapes, colors, and fonts. On the right is a word cloud I created based on the content of this newsletter. One challenge with some word cloud tools is their dependence on Java or Shockwave plugins, which require frequent updating. That’s one of many reasons to consider using the Word Cloud Generator Add-on for Google Docs. 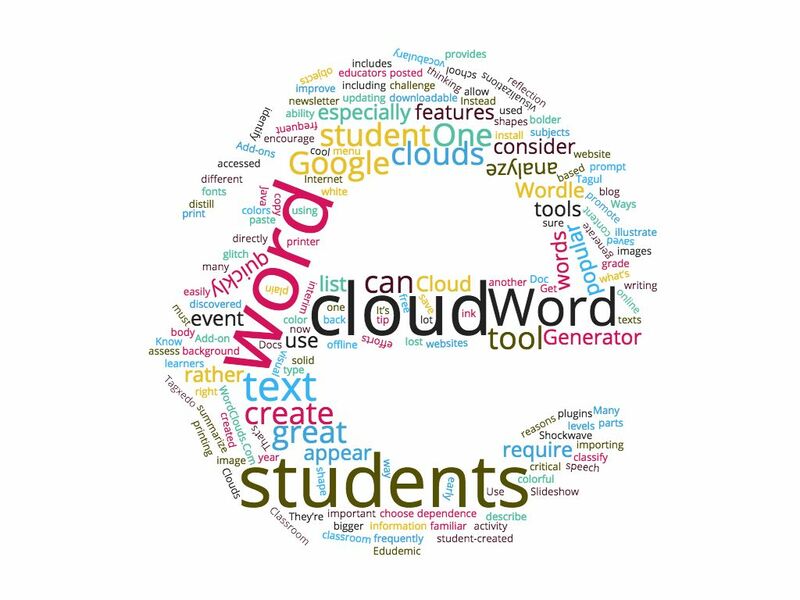 Once you and your students install the Word Cloud Generator, it can be easily accessed from the Add-ons menu in a Google Doc to generate a downloadable word cloud.